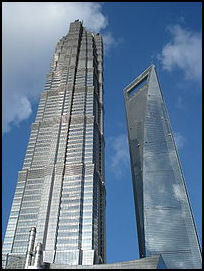 Shanghai Is the largest, richest and most cosmopolitan city in China. Built on mud flats of the Whangpo River, about 20 kilometers up the Yangtze from the Pacific Ocean, it is home to about 20 million people---a remarkable number when you consider it has only been around for about 160 years. The “hai” in Shanghai means ocean. Andrea Sachs of the Washington Post described Shanghai as “an economic renegade....dialed to high speed, trying to be the first to reach some undefined finish line. Drivers disregarded speed limits and red lights, pedestrians move with the force of an undertow, futuristic building materialize nearly overnight.” Shanghai is a municipality like Beijing, Tianjin and Chongqing. The old parts of town are a mix of European buildings, crowded working class neighborhoods, and vast expanses of drab buildings, smokey industrial complexes and manufacturing centers. New Shanghai is a city of striking skyscrapers, pedestrian-hostile roads, modernist transportation, and smoke-filled, hazy skies. The impressive skyline grows higher and become more surreal every day, filling up with futuristic architecture that makes it look like something out of Flash Gordon, The Jetsons or Fritz Lang’s Metropolis. By some counts Shanghai is the world’s fastest-growing city. It sprawls like Los Angeles but is dense like Manhattan and has had more than 10,000 high-rise buildings constructed in it in the past quarter century. From the sky neatly-arranged, apartment blocks that look like rows of oblong houses go on and on and on. On ground, especially in the city center, Shanghai is a intense, sensory place with little space. Sidewalks and markets are filled with vendors selling all kinds of things; the aroma of seafood, snacks and cakes being deep fried in oil permeates the air; almost everywhere you look there are huge crowds. In the backstreets many people live, crowded with several families in 100-year-old shikumen designed for a single family. Since there often isn't enough buildings to house everyone and their businesses people treat the streets as their living rooms and sidewalks as commercial space. Shanghai is regarded as more livable and less ugly than Beijing. The pollution isn’t quite so bad and the development hasn’t been quite so reckless. There are lots of trees and enough water and an effort has been made funnel people on to subways rather than cars. Critics claim Shanghai is on the road to becoming like Singapore and lacks the intellectual and cultural vibrancy of Beijing. Shanghai is the most populated city in the most populated country in the world. It is also the fifth most populated city in the world. Only Tokyo, New York, Sao Paulo and Mexico City are larger. 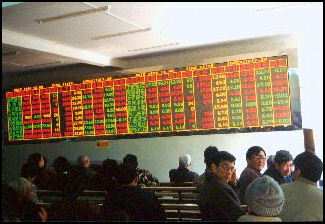 There are 8 million people in Shanghai city and 19 million in the Shanghai municipality, which covers 2,500 square miles, plus an additional two to three million unregistered migrants, most of them rural people who have moved into shanytowns and slums, and work primarily in the service and construction industries. 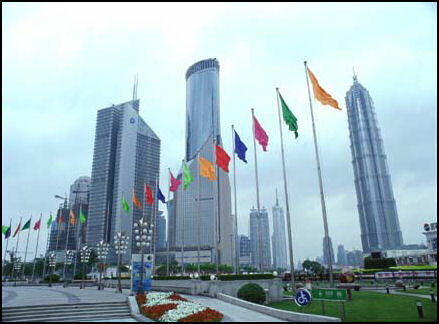 Shanghai grew from 4.3 million in 1950 to 15 million in 2000 and is expected to reach 25 million in 2015. The number of foreign visitors to Shanghai was 4 million in 2004 , about half of them tourists and half of them business travelers. Shanghai is not particularly known for its ancient history. One noodle shop owner told the Washington Post, “If you want to see 2,000 years of history, you go to Xian. If you want 500 years of history, go to Beijing. If you want to know what will happen, you go to Shanghai.” Up until 1842 Shanghai was just a small fishing village. After the Opium Wars (1839-42) and the bombardment of the Chinese fort at Huangpu by the British man-of-war Nemesis, the British coerced the Chinese into making Shanghai a "treaty port" with a self-governing British district called a concession. Quick on the heels of the British came sizable populations of Americans, French and Russians. 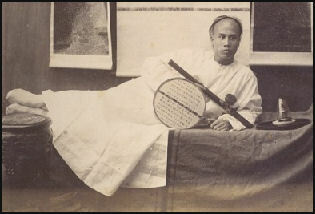 By the 1850s, Shanghai had a community of 60,000 expatriates, most of whom lived in separate concessions which were divided along national lines. In 1863, the British and Americans merged their territory into the International Concession. Brook Larmer wrote in National Geographic, “In the beginning it was a foreign dream, a Western treaty port trading opium for tea and silk. The muscular buildings along the riverfront known as the Bund (a word derived from Hindi) projected foreign, not Chinese, power. From around the world came waves of immigrants, creating an exotic stew of British bankers and Russian dancing girls, American missionaries and French socialites, Jewish refugees and turbaned Sikh security guards. To serve the international community and seek their own fortune many Chinese moved to Shanghai. A busy harbor carried out about half of China's foreign commerce. 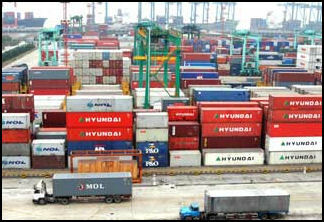 Goods from the interior of China came via the Yangtze River. Suzhou Creek linked Shanghai to the Grand Canal. Railways were built that linked Shanghai to Beijing and other parts of China and the world. . Known as both the "Whore of Asia" and the "Paris of Asia," late 19th-century Shanghai boasted fine restaurants, exquisite craft shops, backstreet opium dens, gambling parlors and brothels with names like "Galaxy of the Beauties" and "Happiness Concentrated." In the 1920s, foreigners played polo and enjoyed dog racing and horse racing. By the 1930s, Shanghai was the largest trading center in Asia, among the ten largest cities in the world, arguably the most decadent place on the planet, and a city so westernized, it had its own Chinatown. By some counts one in 20 women worked as prostitutes and Western taipans and Chinese compradores amassed huge fortunes, engaged in intrigues and plots and threw lavish parties. Larmer wrote in National Geographic, “It was like no other place on Earth: a mixed-blood metropolis with a reputation for easy money---and easier morals. The British, French, and Americans built gracious homes along tree-lined streets. Local shops carried the latest fashions and luxuries. The racecourse dominated the center of town, while the city's nightlife offered everything from dance halls and social clubs to opium dens and brothels. The whole enterprise, however, rested on the several million Chinese immigrants who flooded the city, many of them refugees and reformers fleeing violent campaigns in the countryside, beginning in the mid-1800s with the bloody Taiping Rebellion. The new arrivals found protection in Shanghai and set to work as merchants and middlemen, coolies and gangsters. For all the hardships, these migrants forged the country's first modern urban identity, leaving behind an inland empire that was still deeply agrarian. Family traditions may have remained Confucian, but the dress was Western and the system unabashedly capitalist, and the favorite soup, borscht, came from Russians escaping the Bolsheviks. "We've always been accused of worshipping foreigners," says Shen Hongfei, one of Shanghai's leading cultural critics. "But taking foreign ideas and making them our own made us the most advanced place in China." The Japanese occupied Shanghai from 1937 to 1945. In that time, Shanghai was the only city in the world that did not require a visa and was sort like Asia’s answer to the Casablanca, attracting thousands of displaced people, from all over the world, including Jews fleeing Nazi Germany and white Russians fleeing the Russian Revolution. After the Communist takeover in 1949 about 2 million people from the countryside moved into the Shanghai. There was not enough jobs, food or housing for them so the government shipped about a million of them to farms, public works projects and industrial zones. 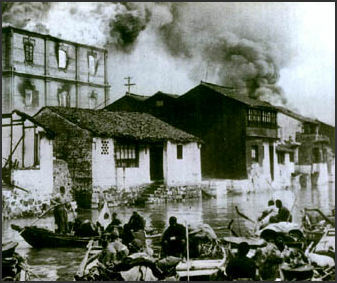 "China's socialist overlords" Larmer wrote, "made Shanghai suffer for its role as a modern-day Babylon. Besides compelling the economic elite to leave and suppressing the local dialect, Beijing siphoned off almost all the city's revenues. The scale of development Shanghai has experienced has been enormous and been compared to the rebuilding of Japan and Europe after World War II. Billions of dollars has been spent on public works programs, new office towers, hotels, shopping centers and factories. A 208-square-mile industrial development called the Pudong was built with some of the world’s highest skyscrapers and billion-dollar auto and steel plants. As of 2006, the United States has invested more $6 billion in the Shanghai area and imports at least $25 billion in products from the region annually. U.S. companies with major research centers in Shanghai include DuPont, Rohm & Haas and General Electric. IBM and Intel are among the companies that have established their Asian headquarters and major manufacturing operations in Shanghai. 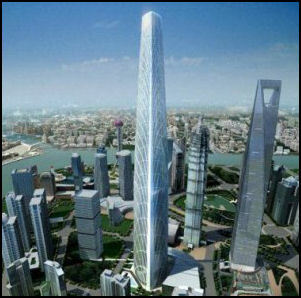 Shanghai is like one huge construction project and most of what is completed was built in the last 20 years. More than 27,000 companies have participated in 20,000 projects, including 3,000 high rises, and 5,000 major projects like new bridges, tunnels, ring roads and public housing. In the late 1990s, according to some estimates, Shanghai was the site of 10 percent of the world's commercial construction projects. As of 2006, there were 4,000 skyscrapers in Shanghai, nearly double the number in New York City, with another 1,000 due to be completed in the next ten years. Brook Larmer wrote in National Geographic, "Shanghai's moment has arrived. Fueled by years of growth faster than China's as a whole---and a culture now unshackled and dealing comfortably with the outside world---the city is eager to recapture the glories of the past, only this time on its own terms. Twenty years ago the European buildings on the Bund stared across the Huangpu River at low-lying farmland dotted by factories; today that same land bristles with skyscrapers, including the 101-story World Financial Center. All told, the city has added more than 4,000 high-rises. For a place once dominated by rickshaws and bicycles, the most extraordinary statistic may be not vertical but horizontal: nearly 1,500 miles of roads in and around Shanghai that did not exist a decade ago." Shanghai fascinates urban planners because it is already huge and is still growing at an amazing pace and has lots of money to play with. The amount of living space per person in Shanghai has grown from 8 to 16 square meters between 1990 and 2008. This means that not only is the city growing at an amazing pace in term of numbers these numbers they are also growing in terms of the space they need. Shanghai residents are proud of their city’s explosive growth. Huge skyscrapers have gone up in the business center. Massive concrete pylons rise from densely-populated neighborhoods for elevated highways that snake through the city and converge at the Yanan Road flyover. The mix of futurist skyscrapers and garish shopping complex have made Shanghai a popular location for movies set in the 22nd century. Much of the city’s development was launched by former mayor and leader Zhu Rongji. In the 1990s $1 billion was authorized for a "green belt" beautification program and $24 billion was allocated to build a subway system, a second international airport, a container port, more tunnels, freeways, railroads, and water and sewer facilities. Around 5 million square meter of property is demolished each year to make way for new buildings, parks, highways and residential area that house people more efficiently. Entire neighborhoods with Ming, Qing and Republican-era buildings have been leveled by bulldozers and wrecking balls to make room for modern office building. Classic buildings have been given horrible renovations. The 70-year-old sycamores that once lined the colonnade on the Bund have been torn down to make way for a pedestrian esplanade; new development. The old city of walk-up buildings and vibrant street life is being replaced with expensive high rises, underground parking garages and closed door nuclear families. Hundreds of thousands of people if not millions have been relocated. Shanghai plans to spend $2.5 billion on the Expo in 2010 and invest another $12 billion in infrastructure related to the project and in the process relocate tens of thousands of more people. Shanghai has its share of environmental problems. It is often shrouded in smog, with cars accounting for 70 percent to 80 percent of the air pollution Describing a sunny day in Shanghai, the journalist Allen Abel wrote, “the sky is the color and density of oatmeal, feebly lit by an orange disc as vague as a watermark.” Sometimes the smog is so bad you can't see the street from a forth floor window. The Huang Po River and Suzhou Creek stink of human waste, factory chemicals and effluence from pig farms; and the majority of homes still don't have flush toilets. There has been so much development that parts of Shanghai are sinking at a rate of about 10 millimeters a year. Most of it is caused by the pumping out groundwater. This could undermine Shanghai's foundations. The government is making an effort to rectify the situation. In the 1990s several billion dollars was authorized for a "green belt" and improved water and sewer facilities. At the same time, a high rise boom creates a precipitous, sometimes unnerving and sometimes thrilling new landscape. This too is the product of contradiction---the pinnacles at the top of each tower are not pure capitalist spectacle but the result of state planning edicts, to stop extra floors being built on top. There is green infrastructure, in the form of an extensive metro system built at lightning speed, and a Maglev train---though the latter goes only from the Pudong business district to the less-than-green airport. Simultaneously, the city erects the most astonishing, Cyclopean multi-level expressways to induce people off bikes and into SUVs. The megalopolis at the center of the Yangtze river delta, whose factories, refineries and power stations are going at full pelt, creating a charred, apocalyptic industrial maelstrom, suffers nowadays from the consequences of deindustrialization, with numerous inner-city industrial structures ripe for creative reuse. All this raging tension is supposedly harmonious. It is fitting, in a society that still claims to cling to socialist values, while enforcing a spectacularly exploitative primitive accumulation. In 1995, there were 3.5 million bicycles and 350,000 cars in Shanghai. At that time traffic often grinded to a halt with bicycle gridlock when too many bicycles from different directions converged on a single spot. Over the past decade or so bicycles have given way to cars as hard as the Shanghai government has tried to prevent that from happening. In the 1980s, planners in charge of overhauling and modernizing Shanghai made a great effort to spare the city traffic jams and pollution by constructed bridges, elevated highways and a new subway system. The government has also tried to keep cars off the road by making it expensive to own a car and difficult to get licence plates and drivers licenses. (See Education...Transportation, Transportation, Driving and Owning a Car in China). By some measures this has been a great success (Shanghai adds about one forth the number of new cars each year as Beijing, which has much lower licensing fees). But still the effort has fallen way short of the goals that planners hoped to reach. 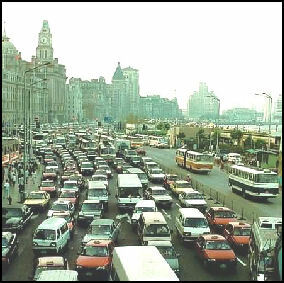 Shanghai has become choked with cars, fumes, traffic jams and gridlock just like any other city. The planners planned for Shanghai to reach the 2 million vehicle mark in 2020. It reached that figure in 2005 and growth continues at a rate of about 15 percent a year. Another miscalculation has been the subway system. Some lines have fewer than expected riders. One of the problems is that not enough train cars are available and the trains are overcrowded, encouraging more people to use their cars. Even if trains are available planners have to overcome an increasingly cavalier American attitude about driving. One Buick owner, who has station for a new train line near his home, told the New York Times, “I’m hoping other people will ride it so that the traffic gets better. I’ll keep driving my car, though. It’s more comfortable because I can listen to music, use the air conditioner, and its not crowded.” He added that fixing Shanghai’s traffic problem was the government’s problem. To relieve congestion an effort is being made to reserve some roads for cars and others for bicycles. So far the trend favors cars. In 2004, bicycles were banned from all major roads in Shanghai to make more room for cars. The first phase of huge new container port---the Yangshan Deep Water port---opened in Shanghai in December 2005 on an island 32 kilometers out to sea and connected to the mainland by a 30-kilometer six-lane bridge, one of the longest in the world. The bridge alone took 2½ years and 6,000 workers to build. When the port is complete it will be the largest container shipping port in the world, able to handle 20 million containers a year. It is expected to be completed in 2010 at a cost of around $20 billion. Many predict when this port is in full operation Shanghai will overtake Hong Kong and Singapore as the world’s largest port. .
As of 2009, the port in Shanghai was the world’s busiest. It has experienced 20 percent growth through much of the 2000s and aims to become a full-service, world-class shipping center by 2020 complete with “software” that it lacks now such as ship financing, reinsurance of ships and arbitration. The centerpiece of the expansion will be the Yangshan Deepwater Port, which is connected to the mainland via a 32.5-kilometer bridge. The shipbuilding facility on Changxingdao Island near Shanghai were finished in the fall of 2008. It is one of the world’s largest shipbuilding sites. The Shanghai Expo 2010 will be held in Shanghai over six months in 2010 and is expected to draw 70 million visitors and 200 participating nations. 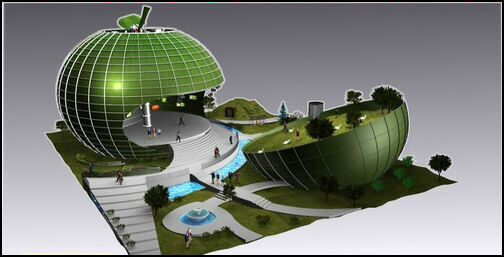 Far and away the most expensive World Expo ever, it will be held on a site that covers an area twice the size of Monaco. Billions of dollars will be spent on it and and tens of thousands of people will put to work. The people of Shanghai are considered "blunt, offhand, and presumptuous.” Traditionally more worldly, Westernized and wealthy than other Chinese, they like their food cooked in rapeseed oil and view themselves as different from other Chinese, who they sometimes dismiss as still living in the Stone Age. The rapid Shanghai dialect is difficult for those outside the city to understand. Some have compared Shanghainese to New Yorkers. Both carry themselves with haughty superiority and share a sort of "it-stinks-but-its-great" attitude about their cities. One Hong Kong banker said the Shanghainese "have a strong sense of self-importance." Both Shanghai and New York have traditionally been regarded as places where one can find anything: the latest fashions, the best food, drugs, girls...and boys. The Shanghai-based writer Wang Anyi told Newsweek: “Shanghai people have a long tradition of following the rules. Beijing people are a bit wild and grandiose.” People from Shanghai live to an average of 76.5 years, about 6½ years longer than the people from the rest of the country. The mayor Shanghai told the Washington Post that the reason for this is that they do tai chi exercises every morning and go to bed before 10 every night. Text Sources: CNTO, New York Times, Washington Post, Los Angeles Times, Times of London, National Geographic, The New Yorker, Time, Newsweek, Reuters, AP, Lonely Planet Guides, Compton’s Encyclopedia and various books and other publications.